Can't read my stick much anymore. Anybody have a good pic of measurements for 26/27 cowl tank ?? found one but couldn't read the small blurry numbers. Here is one that Ken Kopsky posted . Thanks John , but I just can't make out all of the fractions, on the pic. This should be pretty close if not dead on to what the picture shows. I was able to blow it up but obviously it got harder to read in some spots. Wonder why folks back then wanted to know how many gallons rather than just F, 3/4, 1/2, 1/4, and E that we are content with today? Do you think they wanted to verify that had gotten the amount they paid for? If I'm down to 1 gallon in my oval tank TT, the difference between 1-9/32 and 1-1/4 isn't real important. I'm more worried about making it to the gas station. An original stick I have shows both a 9 and a 10 gallon round tank. What was the 9 gallon round tank used on? Makes sense, Colin. That could indeed be it. This week I measured with a stick the gas in the cowl tank. It read 4 gallons. When I went to the station I was surprised to find that it 4.9 gallons to fill. So I am not quite sure the stick is accurate. Anyway, an interesting aside. We went on a joint tour with the Model A club from Yuma to Wellton, about 45 miles by back roads. Some of the Model A's ran out of gas along the way. None of the T's ran out. You see, the T's don't have a gas gauge, so we started out with a full tank. The A's read about 1/4 tank and so they thought they would fill up when they got down to almost empty. Well, we didn't pass any gas stations along the way! "Take car of the top half of the tank and the bottom half will take care of itself." Most of those sticks were made and provided by a multitude of parts suppliers and repair shops. One I have has markings for three types of Ford Tanks and one column marked for Chevrolet. I have seen several marked for other make autos also, including Overland. Which I think was a slightly smaller tank. 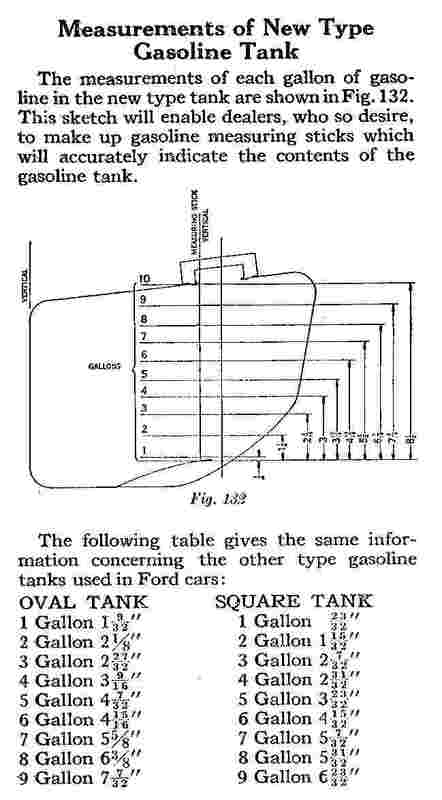 Wasn't the model T oval tank actually only about nine gallon? If correctly done, the graduations are different for an oval tank than for a round tank. Here's the upper end of it. It says only "Ford" on it. Very interesting! Three of those I am familiar with. 9 gallon round Ford? Never heard of one. Wayne - I think the torpedo had a round tank. this stick must pre-date the "Improved Ford" gas tank. Don't know why it lists "9 Gallon" separately, as the only difference is a lack of the number "10"